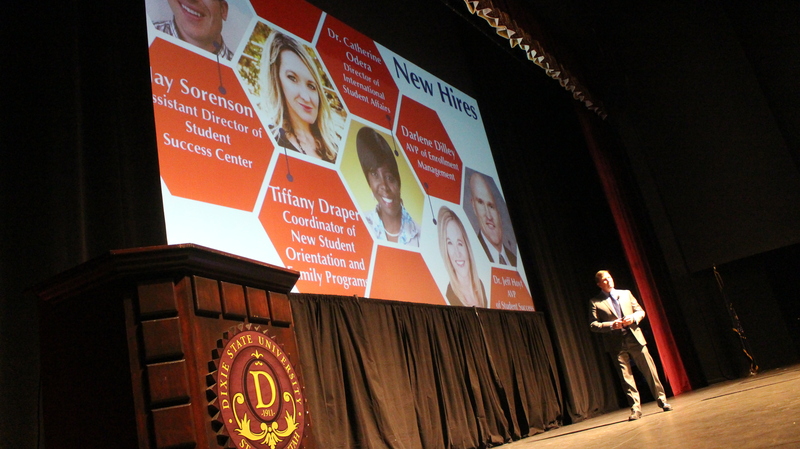 ST. GEORGE — Dixie State University has experienced significant growth in numbers and diversity in the past decade, and is poised to grow even further, DSU President Richard “Biff” Williams said Wednesday during his annual State of the University address. Speaking to a crowd of several hundred gathered in the M.K. Cox Performing Arts Center on the DSU campus, Williams outlined the university’s recent progress and shared details regarding its strategic plan for the future. As the speech ended, members of the audience comprised of students, staff, alumni and members of the general public, rose to their feet and applauded. Williams’ speech was accentuated by multimedia, including illustrative graphics and short video clips. His staff also posted live updates via Twitter during the event. DSU’s strategic plan aims to bring the university “from status to stature” by 2020, Williams said, noting that the plan started three years ago and has included the input of many stakeholders on campus and throughout the community. Williams began his speech by highlighting how much Dixie State has grown in the past decade. Since 2007, the number of majors offering bachelor’s degrees has grown from nine to 38; because some majors offer both a Bachelor of Arts and a Bachelor of Science, the overall number of degrees offered is 52. In addition, the number of enrolled students has increased by more than 4,000 to nearly 9,700 today, with the current incoming freshman class of 2,300 students setting a record for the largest class for the second straight year. DSU’s faculty and staff numbers have also nearly doubled over the past decade, growing from about 1,000 to nearly 2,000 employees, he said. “Can you imagine what we will look like in 10 more years, or what we will look like when our strategic plan is finished in 2020 and we start the next one?” Williams said. The first strategic goal is to promote student success and increase retention and completion rates at all degree levels. To that end, DSU’s Health and Counseling Center was moved closer to campus and has hired more staff to attend to students’ physical and mental needs, Williams said. The second goal is to broaden and enhance academic programs to facilitate growth. Several new bachelor’s degrees and other academic programs have been recently added. In addition, a new 155,000-square foot Human Performance Center building is being constructed, with groundbreaking scheduled for Oct. 25 and completion expected in time for the fall semester of 2019. Plans for a new Science, Engineering and Technology building are also in the works. “We’re very optimistic about moving this building forward,” Williams said. He also mentioned the progress of DSU’s Innovation Plaza programs and online offerings. The third goal is to invest in faculty and staff recruitment and retention. Efforts made in this area include increases in salaries and benefits, streamlined hiring policies and enhanced professional development opportunities. The fourth goal is to promote the success of underrepresented faculty, staff and students by enhancing support for inclusion and equity. With approximately 35 percent of its leadership roles now filled by women and approximately 13 percent of its faculty and staff being of minority populations, the university has met or exceeded its initial diversity goals in those areas, Williams said. “We’re the most diverse university in the state of Utah … about 27 percent of our student body is diverse,” Doajo Hicks, DSU’s general counsel and chief diversity officer, said during the public luncheon that followed the president’s speech. The fifth strategic goal is community engagement, with ongoing efforts to promote community outreach and service projects. DSU is creating a Trailblazer Engagement Center this year and will also be organizing Dixie Serves as a network center for volunteerism throughout Southern Utah. Nancy Hauck, DSU’s associate provost of community and global engagement, said afterward she is encouraged by the progress being made in these areas. The sixth and final strategic goal is establishing a strong brand and identity. While noting that the university may have a relatively new mascot in the Trailblazers, represented by a bison, Williams said the idea of blazing new trails is deeply rooted in the university’s century-old heritage. 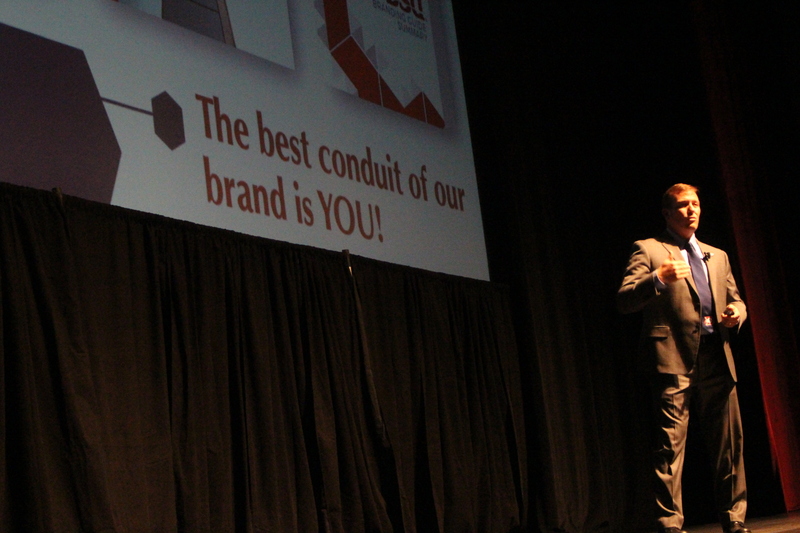 “We didn’t create a new brand; we simply defined who we have always been: Trailblazers,” Williams was quoted as saying in the DSU’s promotional brochure handed out to attendees as they exited the auditorium. Williams also encouraged DSU students, staff and alumni to continue to support university athletics. Among other new enhancements in sports and athletics, a Trailblazer Nation app has been added to enhance fans’ game-day experience. Also, DSU recently resurfaced the track and field in Legend Solar Stadium and will soon add a 5,000-seat grandstand to the stadium’s east side, doubling its capacity. Others who spoke briefly during the hour-long event included DSU student body president Ezra Hainsworth, DSU staff association co-presidents Michele Tisdale and Jonathan Morrell, faculty senate president James Haendiges and David Clark, chairman of the DSU Board of Trustees. To view a video of Williams’ full address, visit this link.